Where Can I Buy a Replica Narwhal Tusk Cheap? The Steampunk Forum at Brass Goggles > General Steampunk > Tactile (Moderators: Herr Döktor, von Corax) > Where Can I Buy a Replica Narwhal Tusk Cheap? 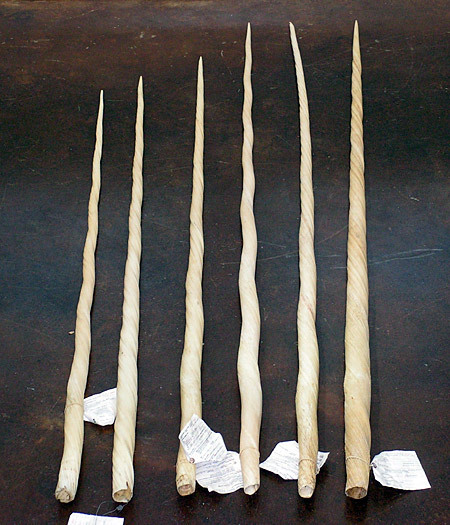 I have an idea to make a cane from a narwhal tusk. The real thing doesn't come cheap, and I've discovered that even the fake thing doesn't come cheap either. The cheapest cast resin replica I've found is $75 bucks on eBay. I could make a hand-sculpted replica, but the materials that I'd probably end up needing could, I suspect, end up costing more than the eBay tusk, and to create the authenticity and realism that I would want would take a lot of time. Does anyone know a cheaper source? Re: Where Can I Buy a Replica Narwhal Tusk Cheap? Maybe you could club some baby fur seals with your cane as well. Hmm... on the programme Full Steam Ahead they featured an old way of making screw threads - heat a bar of steel and simply twist it. I wonder if you could do something similar here; find a tapered cane in a thermoplastic polymer, carefully heat it and, whilst one end is clamped, twist the other using pliers. The problem could be with the length - the twist may not uniformly occur along the full length. Oh, and it's nice to think that only on Brass Goggles could you get a request such as the title of this thread! I once owned the tusk of a whal. Lost it, somehow. Of course, it was twisted in the opposite way, and so would have been of little use to you in this case. The narwhale tusk has a fairly distinctive spiral and texture to it; twisting a piece of plastic would probably not reproduce the look. I didn't know that there was so much variation in the tusks. I would probably want to recreate the look of the really wavy tusk; it should be recognizable at a distance. The one tusk has the look of twisted Silly Putty. Wood shaft Worbla for the finish perhaps.